Are you thinking you don’t need a professional editor to look at your manuscript? I would ask you to think again. 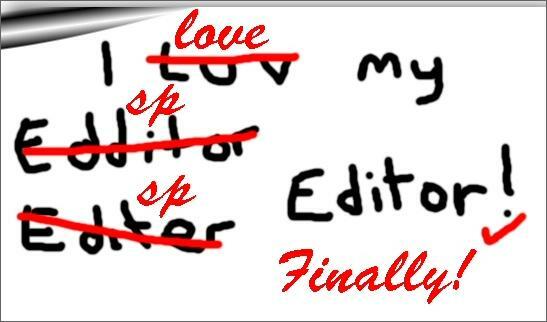 The benefits of a good editor can surprise you, as I found out recently when I hired a “Pro” to go over my manuscript. I didn’t realize I would learn so much about how I write by having a professional copy editor go over my work. Now I wonder why I resisted this lesson for so long. Yes, the classes I took and the books I read helped me get started, but the editor’s handling of my work helped me understand my structure, style, and voice in a hands-on and very personal way that books and classes didn’t. For the first time ever I understand that I actually have a “style”, a “voice” and that they aren’t so bad. Another benefit is that nowadays many sites that accept “self published” or (as I prefer) “indy published” novels or non-fiction ask if it has been professionally edited, because they won’t accept the work if it hasn’t been and with good reason, in my opinion. In today’s world anyone can “self publish” whatever they want. Self publishing is good, and is also a pain. Reason: there is no industry standard and a lot of what is out there is not all that interesting to read. Sorry if this upsets you to hear, but it’s the truth. Just take a look. Think about your readers and look through their eyes. When you search for something to read it’s like shopping anywhere else. You go to a store (or more than one), normally for its reputation and/or ease of shopping. You take time to investigate whether the towels you want are worth what the store is asking for them. You look at a lot of different styles and colors, at quality and price to make sure you get what you want. Why should a book be any different? It isn’t, so it’s up to you to make sure that what you put out for sale is the best it can be, that when your prospective reader (or maybe an editor for a major publishing house) picks it up or reads a review about your novel/non-fiction, that they get what they want/expect. Investing in your writing this way can also help other writers to better their work by raising the standards. If you are considering submitting your work to an agent/publishing house or indy publishing, please seriously investigate using a professional editor first. I thought I didn’t need one and couldn’t afford one when I submitted my novel. I’d had at least six different people, and not all of them “friends”, read the manuscript before I submitted it. Sending it out was good and their comments helped dramatically to upgrade my work, but now, after having had a pro go over it (a copy editor not a proofreader) I am amazed at how much more I learned about my own writing and how much smoother my novel now reads. Next on my list is a search for a proofreader who will find the typos and misspelling (if any, ha ha) and correct them. “My” professional editor has enabled me to traverse an amazing learning curve. I feel more confident that what I submit the next time (or indy publish) will be the best I can make it. You can bet I will use my professional editor again because I know the money will be well spent on someone who truly knows how to make me a better writer. Don’t deny yourself the opportunity to learn just how good, and professional, your writing can be. Check out these articles for more information on types of editing. Hi Lisa I read this with real interest. Made me think hard about using a professional editor next time round. How's the book promotion going - very successfully it seems from the outside!